The carrying capacity of a landscape refers to the quantity, quality, and distribution of resources necessary to support human populations. This is implicitly a reflection of other environmental considerations like climate, water supply, and soil quality, and it is independent of external factors like enemy populations or the presence of predators (e.g., bears, big cats, wolves). The carrying capacity of northern Canada presents severe upward limits on the size of the population that can exist in pre-industrial conditions. Aboriginal peoples in the North typically organized themselves into small family-based groups, all of which harvested food and material resources extensively rather than intensively. As hunter-gatherer-fisher societies rather than farming societies, their survival depended on their knowledge of the landscape, seasonal and immediate weather, travel routes, and the movement of migratory animals. Inuit populations, which faced some of the most daunting environmental challenges on the planet, were necessarily small and isolated, only coming together seasonally and even then not in very large numbers. There are no indications of major population concentrations or villages north of the treeline prior to contact, and the evidence continues to suggest that transmission of trade goods across the Arctic was much, much slower than was the case in the southern half of what became Canada. Figure 8.2 Sadlermiut man paddling an inflated walrus- or seal-skin bladder, ca. 1824. The indigenous social landscape of the Arctic reveals much about the character of human migration. Between 900 CE and 1500 CE the Thule people moved steadily across the Arctic Ocean’s shoreline and islands from Alaska to Labrador. Their advance was slowed but not halted by the indigenous Dorset people, whose members may have encountered Norse expeditions before being effectively overwhelmed by the Inuit. Notwithstanding what may well have been a Dorset enclave of Sadlermiut to ca. 1903, the whole culture was gone by the early 16th century. The timing of the final collapse of the Dorset may indicate the impact of early European contact and the possibility of yet another disease frontier. In any event, Inuit culture — descended from Thule traditions — dominated the arctic rim of North America from ca. 1500 to the present. A hunting and gathering people, they participated in Aboriginal trade networks and had a fully developed trade dialect, but were slow to integrate into the European fur trade system. In part this is because, like the Beothuk, they could obtain much of what they needed by raiding and/or picking over fishing and whaling sites abandoned by Europeans. Passing fishing fleets, as well, acted as informal trading partners with the added bonus that they did not represent competition for land resources. European interest in the North was muted for centuries in part because the landscape did not support significant populations of beaver. However, once the market appeared for other species, such as the arctic fox, the Euro-Canadian presence grew. As a result, the proto-contact period in the North lasted much longer than it did anywhere else in North America. Trade between Inuit and Europeans occurred around Hudson Strait from 1611 if not earlier, and fur supply ships on their way to posts in Hudson Bay often stopped to trade along the north coast of Ungava. The first long-term European presence among the Inuit, however, did not arrive until the Moravian mission of 1811 at Kuujjuaq (a.k.a. Fort Chimo), fully two centuries later. The Inuit farther west were from time to time impacted by a European presence that they did not necessarily see or meet. For example, the early struggles between the French and the English at the south end of Hudson Bay resulted in 1686 in the closing of three HBC posts, and six years later Prince of Wales Fort was closed. These events and an outbreak of disease on the west coast of Hudson Bay prompted the Cree to explore opportunities to the south, and the Chipewyan (a.k.a. Denesuline) followed suit. The Inuit, in turn, moved into the vacuum that was left by the Chipewyan. They were seizing an opportunity, one they probably did not realize arose in part from European naval battles a few hundred miles away that had repercussions throughout the region. 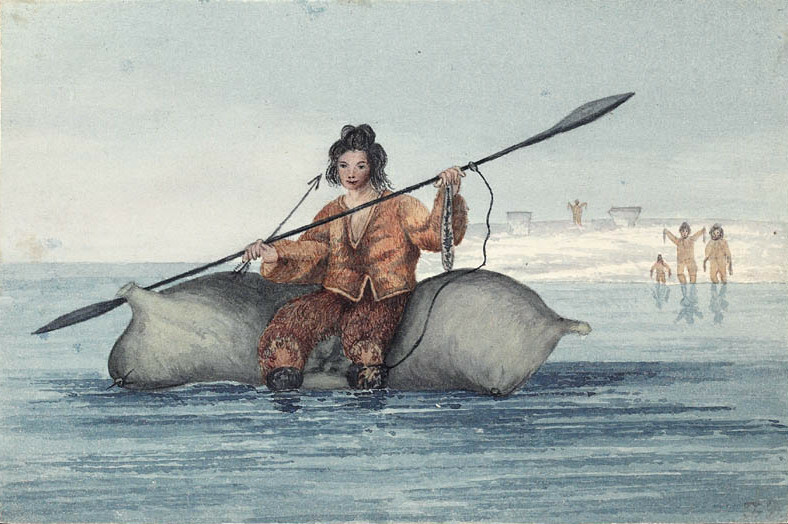 The Arctic fur trade was simply a bridge too far for Europeans and Canadiens in the 18th century. The same was true for most of the 19th century. Wintering on the Arctic Ocean did not appeal to the outsiders, and there was not enough time in the year to complete an annual circuit from York Factory or Fort William. The expeditions of John Franklin in 1819, 1825, 1826-27, and 1845 give some indication of the difficulties encountered by Europeans in the North. Two of Franklin’s voyages were famous disasters and the others failed to fully complete their missions. They were organized along all-male, naval/military lines, and the shipping technology placed a premium on size, weight, and sails. On land they travelled with the destination — rather than survival — foremost in their minds. The Inuit, by contrast, made use of light, fast, minimal draught paddle-powered kayaks that did not rely on wind; their itineraries were based on the location of food supplies, regardless of detours, and they travelled in family units in which all members contributed to success in many ways. Women in particular ensured the survival of their people on long journeys by preparing food, clothing, hides for shelter, snowshoes, and moccasins; snaring small animals; and helping repair canoes. Samuel Hearne learned this lesson the hard way in the 1770s, but it was a lesson seemingly lost to his 19th century successors. The inability of the newcomers to penetrate and survive in this region slowed their advance, moderated some aspects of cultural change among Aboriginal peoples, and proved to be an advantage to the indigenous population in many ways. Figure 8.3 Missions to discover the fate of the 1845 Franklin expedition did not return empty handed. 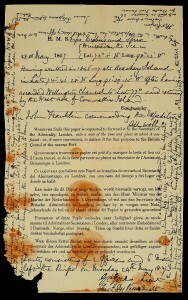 An 1859 team recovered this message with marginal notes indicating the ships were trapped in the ice, the remaining officers and crew had set off on foot, and Franklin was dead two months later. The Erebus was finally located in 2014. Aboriginal life and trade in the North is structured differently from what we have seen south of the treeline. The landscape, climate, and fur resources placed limits on direct European engagement in the region. European attempts to penetrate the North before the 20th century were largely unsuccessful. Sadlermiut whaling by Kompakt is in the public domain. 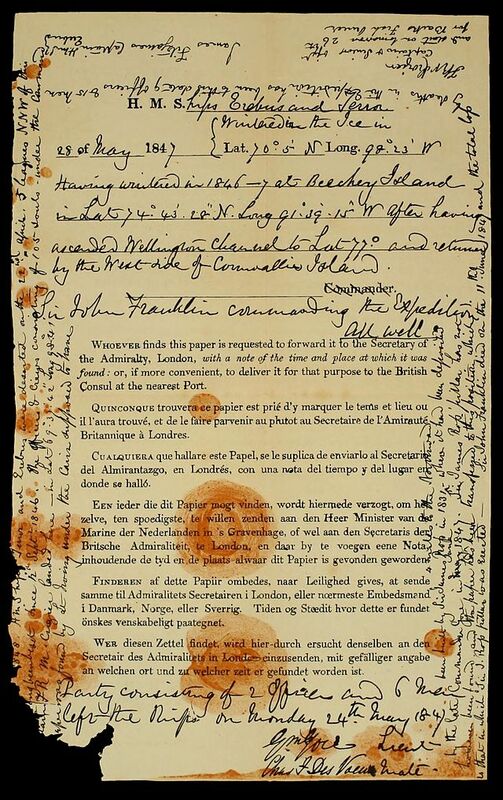 Franklin expedition note by Petecarney is in the public domain. 8.2 Northerners by John Douglas Belshaw is licensed under a Creative Commons Attribution 4.0 International License, except where otherwise noted.